I made this Lightning McQueen cake for my son Netanel's third birthday party. First I made 2 cakes, one 10x13 rectangle for the base and one in Wilton's car cake pan. I then used apricot jelly to place the fondant and created the yellow and white checkerboard base. I placed the car on top and covered it with the jelly and red fondant. Then I placed white windows and yellow lightning bolts and the number 95 on the car. I used oreo cookies for the wheels. Last, I used the Betty Crocker icing tips to put the black outlines on the windows, checkerboard, and to make the eyes. Then I brushed the whole thing with vanilla extract to smooth out the edges on the fondant. It took me 3 hours to decorate the cake and I baked the cake the day before. What a great cake - thanks for sharing and awesome job! Join in and write your own page! It's easy to do. How? 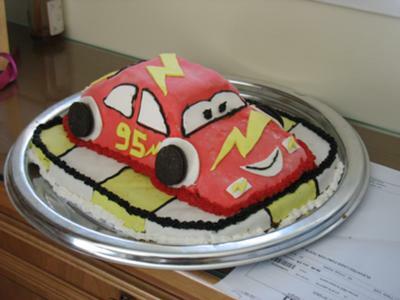 Simply click here to return to Lightning McQueen Cake.